Please be aware that the host Marriott hotel is only holding rooms for IMOA members through July 2. Rooms may still be available after that, but there is no guarantee. The Spring Classifieds are already posted in the Classifieds section. 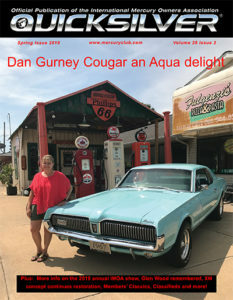 The Spring issue also features a look at the career of the late Glen Wood, part of the Wood Brothers racing team; a look at some Aqua-themed Mercurys; The continuation of Tom Maruska’s restoration of the 1956 XM Turnpike Cruiser concept car; IMOA President Jerry Robbin’s review of the 2019 Ford Ranger Lariat; Members’ Classics, Letters to the Editor and more. Some of these stories are in the Blog section. Please note that when you click on the link and it takes you to the PDF image, you will have to click again to get both pages. The club dedicated to Mercury lovers everywhere. On this website you will be able to see what IMOA is all about. You will be able to make contact with other members, keep up to date on upcoming events and find valuable info on any Mercury you may be interested in. Browse through our classifieds to find that dream car or hard to find part, check out pictures and stories about member's cars in our 'Member's Classics' section, or read a tech article on that repair you've been needing to do. If you're not yet a member, be sure to visit our 'Join The Club' section to find out about all the great benefits of being an IMOA member and see how easy it is to become a part of this great group. We look forward to hearing from you!! !